The UltraWater starts with the BioStone Impregnated Carbon AlkaViva then turbocharges it with UltraWater technology ensuring unmatched water filtration/water contaminants reduction . 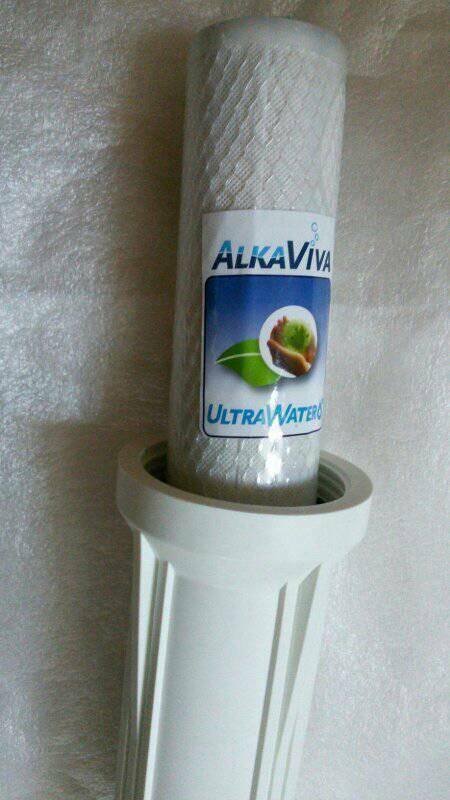 The AlkaViva UltraWater filter removes up to 99.9% of virtually all water contaminants, including Chloramine, Pharma, heavy metals and the toughest to remove water contaminants like chromium IV and arsenic. Add Scale Guard protection and it out performs any other water filter we know of. Clearly the BEST choice you can make in a water filter. The UltraWater filter uses the highest quality medias available and then transforms them into solid forms to literally block contamination from passing through and ending up in your glass. This creates a greater contact time with the water and removes much higher percentages of water contamination than traditional loose media beds. The UltraWater Filter offers superior removal of chlorine, chloramines, disinfectant byproducts, VOC’s, pharmaceuticals, and heavy metals such as mercury, lead, nickel and iron (most to non-detectable levels in laboratory testing – UltraWaterResults). In addition it greatly improves taste and odor giving you a great tasting and clean glass of water. 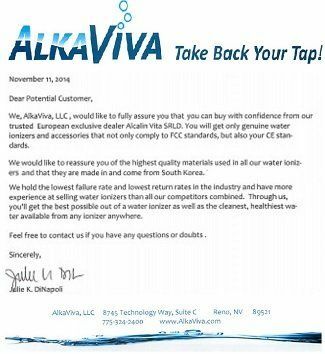 AlkaViva is proud to offer you the opportunity to take back your tap and use the most advanced water ionizer water filter available in our industry. Truly the best water ionizer filter on the market today. 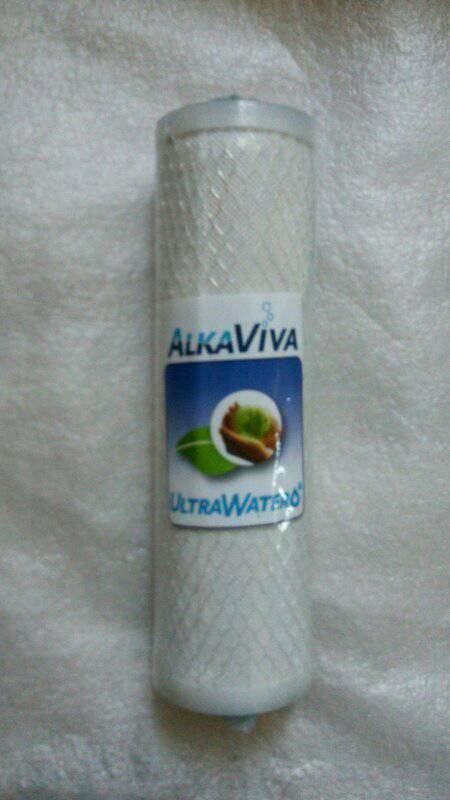 AlkaViva spent two years in the development of the UltraWater filtration technology and it is WELL worth the extra money. How do I know when the UltraWater filter needs to be replaced? Has this UltraWater filter been laboratory tested for contaminant removal? UltraWater filtration technology has advanced to the point where we can remove more contaminants using a smaller footprint because of the greater “surface area” of the internal media. The proprietary media used inside the AlkaViva UltraWater filters are much “finer” than any previous traditional water filter media, and its proprietary design forces ALL the water through the media before it can enter the water ionizer. Other water ionizer filters contain “gaps” that allow water to pass through the water ionizer filter with making any contact with the water filter media – allowing contaminants to pass untreated. 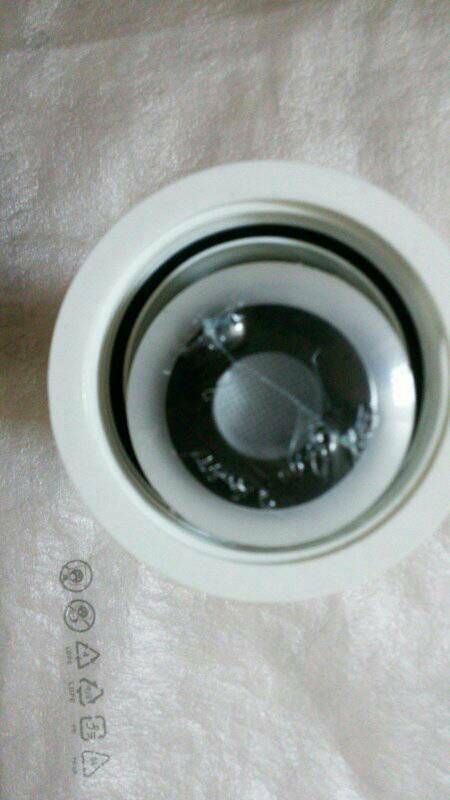 This is NOT true with the AlkaViva UltraWater filters. ALL water MUST pass through the media before it can exit the water filter housing. That is why it took AlkaViva two years of production to get the incredible results, inside of a water filter small enough to go inside your water ionizer. Does this UltraWater filter remove fluoride? Fluoride is one of the hardest contaminants to remove from drinking water, and requires its own very specific media for removal. There just wasn’t enough room inside the regular UltraWater filters to fit the fluoride media as well as the other media. 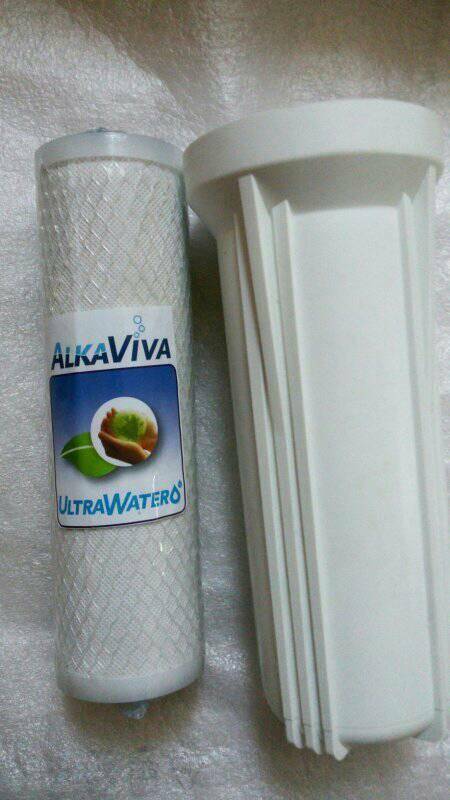 Therefore, AlkaViva created an UltraWater filter – Fluoride-Arsenic shield , which is both an internal and external water filter that can be used in conjunction with the regular UltraWater filter.